Late last night a friend who is working on her wedding registry posted a desperate cry on Facebook. She was looking into towels and paralyzed with fear regarding bath towels (and hand towels and washcloths): should they be white, or could she indulge in the fancy colored towels of her dreams? She seemed to feel that there would be regrets either way; but, Which regret was preferable over the other? She had, last I checked, a couple dozen responses to her query, and many of them struck me as sensible, and some of them struck me as crazy. I quickly grasped that I am someone who has strong feelings on the matter of bath linens (wow, what a shocker), and because I know this person well enough to know that we are often aligned in our feelings regarding household matters, I decided to send her a message. Publicly, I posted a comment saying that I maintain a white towel household, but not for reasons that are as simple as “because you can bleach the towels” or “because I like a boring bathroom.” I said, “It’s very late, I’m too tired to explain my position on this, but this is how I feel about it and I feel strongly about it. I am capable of writing an entire essay on the subject.” A few moments later, I sent her a private message explaining a few key points. But because I got it into my head that I could write an essay on this — much as I wrote an essay on dishtowels — I am going to sit down and explain why the white bath linens are inevitably preferable to the colored ones, no matter how gorgeous the colors are. This is going to be a long piece of text. 1. 100% cotton. No polyester content, ever, not even on trim. 2. Launder in hot water. Never use softeners or dryer sheets. Any towel that won’t feel good without those things is a towel not worth owning. 3. You should always be able to bleach towels because it’s an imperfect world, and there will be times when it is for hygiene reasons necessary to bleach towels. 4. If you have white towels, you never have to worry about things matching. There is no color of towel that is available now that will be available in five years, when you realize you need to get more washcloths. You will wind up with mismatched towels. You will be annoyed. 6. Bath sheets are silly unless you have access, in your house, to industrial laundering facilities. They take forever to dry, which means that, no matter how luxurious they seem when you first buy them, they will wind up smelling of mildew faster than any other towel in your house. 7. If you have children in the house, you will need more washcloths and hand towels than you would ever imagine. 8. If you’re buying a towel by feel, remember that no matter what the towel feels like in the store, it will almost certainly not feel that way after you’ve laundered it. Fabrics always come with some kind of treatment on them, so they feel soft and awesome in the store while they’re on display. That stuff, which is called sizing, washes away. So it has no bearing on what you’ll be dealing with a year from now. If you live alone, presumably it’s possible to invest in colored towels and keep them going for a long time and be careful about laundering and have gorgeous colored towels ten years after the initial investment. However, I do not live alone; I live in a household with two people who are not particularly filthy or slobby, and even so, I know for a fact that maintaining a perfect set of colored towels in this house would be a nightmare. My mother will remember, I think, that our towels when I was growing up were often wonderful colors, but that nothing matched. The towels were mostly Fieldcrest Royal Velvet towels, and very high quality; wonderful towels. I still have one of them, somewhere; it is a dark teal blue. But no two towels matched. There was a phase when we had mostly wheat-colored towels; that was a depressing phase. Nothing good is wheat-colored, I feel, except wheat. Or, I guess, bread. I mean, no home furnishing should be wheat-colored. For a while I was weak and when I had to buy towels I fell victim to the beauty of colored towels. Probably this is because I always lived in rental apartments where I had no control over the bathroom decor except for the towels and, sometimes, the shower curtain. It seemed reasonable that I should be able to pick the color of something. But even so: would it match whatever the bathroom already looked like? I had a pale blue bathroom for four years; I don’t like pale blue! I must have simply tried to put the colors out of my head, knowing that I wouldn’t live in that apartment forever. And I didn’t: in 2002, I took control over the matter. We were about to renovate the bathroom in the first house we’d bought, and I had plans. We would re-do the bathroom; the walls would be painted some smashing color, and the towels would be white. Because — here is another virtue of white towels — you never have to worry about them not matching the paint in the bathroom. When you buy towels to match your room, you’re guaranteeing that either you will get heartily sick of that color, or that when you have to buy more towels in that color, you cannot any longer, and you will, out of dire need for towels, wind up with towels that don’t QUITE match the walls, and you will be SAD. So we had our beautiful new bathroom, which we’d done with black and white tile, and the walls were painted Kermit-the-Frog green. Our lovely white towels were perfect. I never worried about them looking weird hanging on the wall; I folded them neatly and hung them on the towel rods, and it looked perfect. Green towels would have faded away against the wall — and then faded, after so much laundering, and looked depressing. But the white towels are always cheerful. Some people think white towels look antiseptic and institutional; some people think white towels are relaxing, spa-like. I think that it’s a matter of color and quality. If you have white towels that don’t look wilted, and aren’t shredded at the edges, you will find them pleasant to use. So wash the towels frequently; use bleach when needed; use OxyClean or bluing regularly; don’t let the towels molder on the bathroom floor or use them to mop up the fluoride rinse when your husband spills it. They will remain white for a good long time. And you will not be sad when you look at them, freshly laundered and neatly hung on your towel racks. They will look handsome and comforting, folded neatly in the linen closet. Kind of like this. 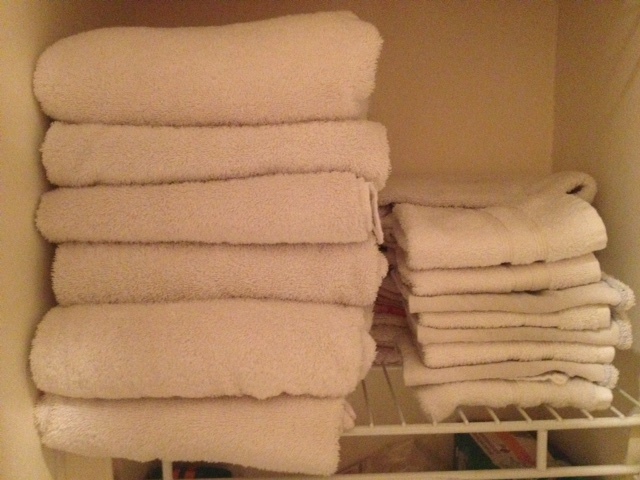 I mean, my linen closet isn’t anything to write home about — whoever designed it was clearly addicted to cocaine and not someone whose linen closet was a personal high priority — but it is orderly, and when I want a towel, there it is, clean and neatly folded.